Each week I write a brand new article to support members of our three wonderful art groups on Facebook, The Artists Exchange, The Artists Directory, and The Artist Hangout. This week we kick off our new artist showcase feature and you can find out more about becoming a featured artist yourself! I have known Jenn for a number of years and she is one of the hardest working artists I have ever had the pleasure of knowing. It also took a few years to bring this showcase together because J.E is also one of the busiest artists I know, and for good reason. Her works are intense, vivid, and memorable, she has a style that is instantly recognizable. J.E is a contemporary fantasy artist who enjoys creating intensely vivid artworks. 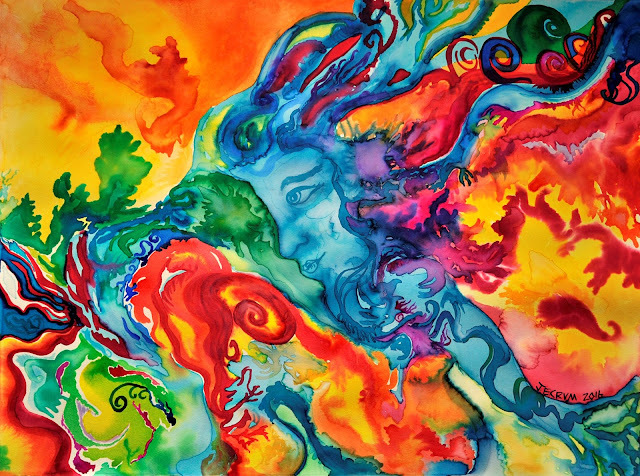 She creates art focusing on the exploratory qualities of liquid watercolor, acrylic and pastel to create abstractions of the human form, developing playful juxtapositions of colors and shapes within the artworks. Extraordinarily J.E doesn’t always know how any of her artwork is going to turn out. She enjoys working intuitively to create art, and tends find inspiration from mythologies she relates to, as personal narratives evolve from experimentation's created. 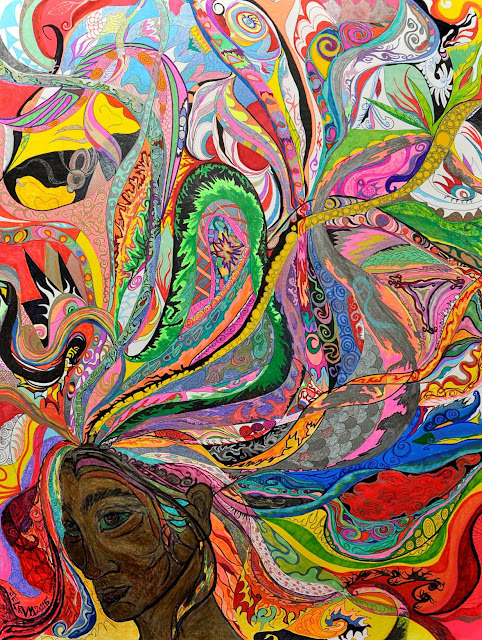 She also focuses on engaging in the aesthetic experience of making art as a relaxation technique, to infer meaning from the art after being ‘lost’ in the process. Also known as Jennifer Crum-Wilson, J.E. enjoys working full-time in a fast-paced career as an elementary art teacher where she currently teaches nearly 1,000 children a week in a 50-mile radius in public schools of a rural locale, from ages four to eleven. She holds a M.A. in Art Education and Research from the Maryland Institute College of Art, Baltimore, Maryland; a B.S. in Art Education from Kutztown University of Pennsylvania and also studied Art at Mississippi University for Women, in Columbus, Mississippi, as well as studied art as a field painter overseas at The Leo Marchutz School of Painting and Drawing in Aix-en-Provence, in the South of France. J.E has shown her work in various solo and group exhibitions throughout central Pennsylvania in galleries, businesses and in community art centers, as well as in cities including Los Angeles and Detroit. She curates art shows for her many students throughout the school year to bring art-enriching opportunities to children in the rural communities where she is an educator. She has also donated work for charity events, such as for the homeless; and enjoys making others happy through the power of art. J.E has enjoyed a number of successful shows over the years and this year looks set to be no different with shows coming up across the State of Pennsylvania. In April, J.E will be presenting, Art by J.E. 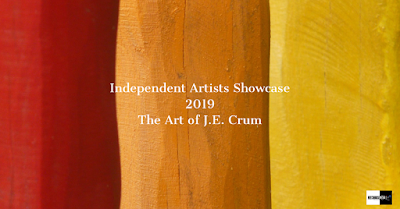 Crum, Solo Exhibition of Original Works from 2016-19, at the Bellefonte Art Museum, Bellefonte, Pennsylvania and then in May, J.E. 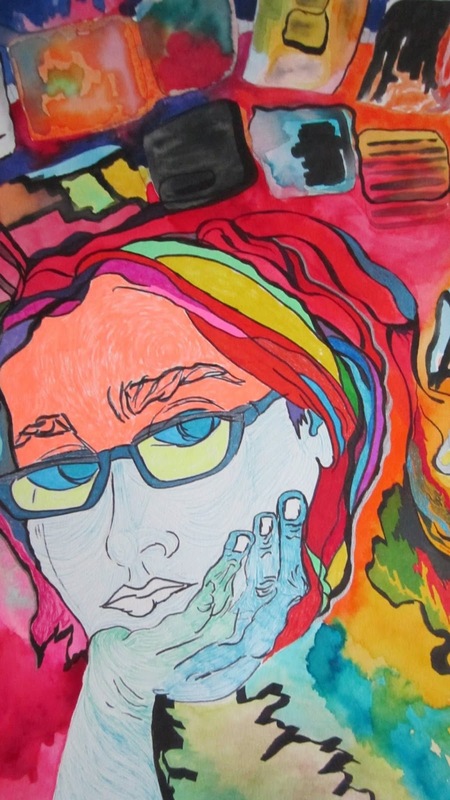 Crum: The Contemporary Fantastical Artist Returns! Which will be held at: Avenue Coffee 209, Lock Haven, Pennsylvania, and to round the year off, Art by J.E. Crum, Solo Exhibition of Prints of Works from 2015-18 at Cafe Lemont, Lemont Pennsylvania in September and October. A busy schedule for any artist and even more so when combined with the other work that J.E does. With her busy art exhibition schedule and her role as an educator it’s testament to her incredible commitment to the arts that she continues to create so many new works each year. Her past exhibitions include venues such as The Bellefonte Art Museum, The Impasto Gallery, in Colorado and at the Tangent Gallery, in Detroit, Michigan and she has also appeared in many publications. So what of J.Es work? As I mentioned earlier J.Es works are richly vibrant and vivid and there is a consistency between all of her works that provides a uniqueness that is unmistakably hers. It’s always refreshing to see art that inspires in the way that J.Es work does and it is equally refreshing to come across work that is always as consistent as this. I absolutely adore this piece, it's not only vibrant but the composition and fun that the work displays really does provide a sense of joy. Fantastic use of colour and the vibrancy of the original work hasn't been lost in its transition to screen. I don't think I could find a piece of artwork more apt to reflect on what is going on around the world in politics today. Contemplation and chaos, and a sense of wondering if there are other things that are deserving of more thought. Again, this is another vibrant work which is so reflective of J.Es style and uniqueness. Take a look through J.Es website though and it is here where you will find an explosion of colour and a truly unique mix of artworks, all with that vibrant style. You can find J.Es website right here, and you can also see her artworks right here. Here standout works for me along with those I have published today have to be, Clasped, Fijian Landscape, The Zephyr, and her EAP Tribute Portrait in honour of Edgar Allan Poe. It is little wonder that I have been talking to J.E for a number of years trying to convince her to come along and take up her place in this year’s Artist Showcase and I am sure you will agree! If you wish to become a featured artist in my latest artist showcase series, get in touch! All I will need from you is a link to your website or online store if you are selling via print on demand, a short write up about you, your story, and your art, and ideally an image which should be a decent resolution, but not a very high resolution. 1200x800 or similar usually works fine, and if you do apply a watermark, please make sure that it doesn’t overly detract from the image. If you also include any social media links but please make sure that Facebook links are to your Facebook business pages only. You can use the contact form on this site or reach out to me on Facebook by liking my Facebook page right here. If you are not practicing art but have an independent business related to visual arts, or want to let the world know about what you do for the arts in your community, then I would love to hear about those things too. If you are a gallery and see an artist you would like to represent throughout the series, please use the contact links each artist provides and deal directly with them. My role is simply to connect the dots, publish the posts and enjoy some beautiful art. If you find an artist then you can always buy me a coffee or purchase a piece of my own art! Any art sold through my Fine Art America and Pixels stores contributes towards to the ongoing costs of running and developing this website. You can also view my portfolio website right here. You can also follow me on Facebook here, and this is where you will also find regular free reference photos of the many interesting subjects and places I visit, together with random stuff that whirls around in my head and occasionally, even a little inspiration. You can also follow me on Twitter @beechhouseart and If you do that Pinterest thing you can follow me right here on there too! And lastly, if there is a subject you would like to see me write about, leave a comment below and let me know what you want. If I don't have the answers then we can always put them to our communities! Congrats to JE! I love her vivid use of colors and her unique creativity! Thanks Colleen, I love her style!